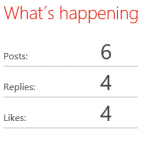 One of my clients who is using SharePoint 2013 Sitefeeds extensively in his new social intranet asked me to build ‘something’ to get some insights out of the Social feeds. 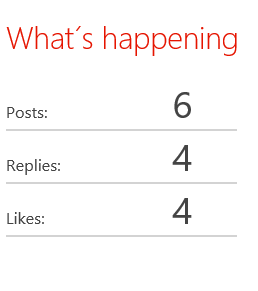 So I went and build a little demonstration just to get the following insights out of a SharePoint Site Newsfeed. var url = "/_api/social.feed/actor(item=@v)/feed(MaxThreadCount=10000)? @v='" + siteUrl + "/newsfeed.aspx'"
document.getElementById("socialThreadStatsStatus").innerHTML = "No Newsfeed found in this web please check configuration"
I updated the script to be able to get more than the default 20 threads. You can use the ‘MaxThreadCount’ Property of the feed to get more threads. I set it in the example to feed(MaxThreadCount=10000) to get up to 10000 threads back. A thread is a post in the newsfeed. This does not count for Replies.